Wortel, the large white cat with its orange tail saunters into the sitting room and greets us with an embarrassingly fine miaau for such an imposing feline. My grandmother sits in her special chair, gives Wortel a quick pat then leans her head back against the soft cushion and closes her eyes. She’s tired after a busy day in the garden. While watering the flowers, ferns and creepers – leaning the long green hosepipe on her walking frame – she had called me to come and breathe in the sweet scent Jasmine gives off at that special Highveld hour when the heat of the day dissipates into a cool evening breeze. She told me how that intoxicating purple fragrance lasts into the midnightly hours, engulfs her and guides her through her dreams. Now she opens her eyes and carefully lifts the glass of milk – the one my granddad had set before her when he had poured us our wine – with both her hands. I jokingly ask if the milk is hiding a tot of something stronger – whiskey perhaps – and she confirms, offering me a sip. I accept and find that it’s not half as bad as I expected. My grandpa switches on the radio. We listen to the cheerful sounds of accordion, guitar and banjo – boeremusiek. I sip my uncharacteristic glass of dry white, settle into my little chair and feel like this is the exact place I am meant to be right now. Blue Crush 2 trailer – cringe worthy or cool? Ek love hoe jy van die goed beskryf. 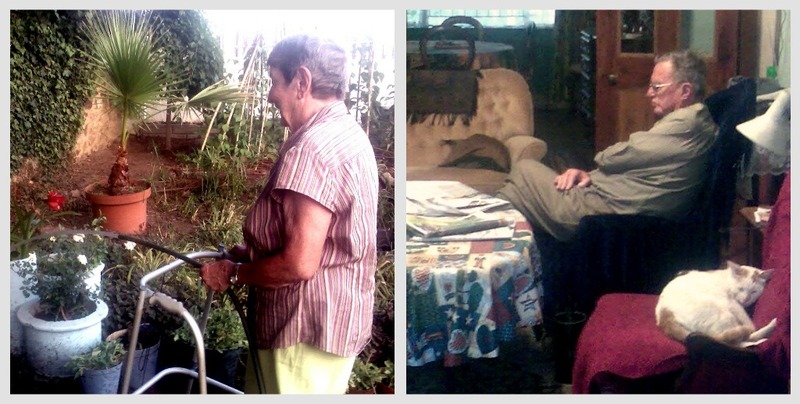 Maak dat ek sommer na my Ouma verlang en sy’t nog nie eers in JHB geland nie. Haha! Dankie! Ja, verlang ook nogals na my ouma hulle en ek het hulle verlede week actually gesien! so descriptive and visceral, i could smell the jasmine as i was reading! i always think it’s so sad how older people seem to fade away into the background in society, so it’s great to know that you value spending time with them, i feel the same way. i only have both my grandmother’s left, but i’ll never forget the way my grandad’s used to move around in their pantoffels, especially my dad’s father, who had a big belly and used to clear his throat regularly, just like my dad does. and, i also love how older people also appreciate their alcohol, my gran even drinks gin and calci-vita when she goes away with her friends- hilarious! It’s only in the past couple of years that I have really started appreciating my grandparents fully, I guess. I am very lucky to still have both my granddad and grandma on my dad’s side, as well as my granddad and step-grandma on my mom’s side. They’re all still crystal clear of mind, even though their bodies don’t always want to play along anymore. They are really all pretty incredible! My other gran died about 15 years ago at quite a young age, but also had a massive impact on my life and the our family does things. Aah, yes – so delicately described and sensitively wrapped, girl. I love the pictures! They are just sooo nostalgic, aren’t they? Your words dance!